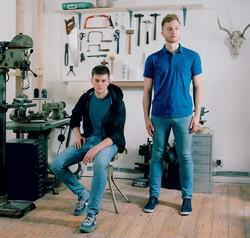 Designers Robin Grasby & Marc Bell are the founders of the International Studio based in London, UK. After Graduating Grasby and Bell collaborated on their first joint project in 2010 and formed International Studio in 2011. They were selected to take part in D3 Contest 2012 at IMM Köln. There, Grasby and Bell were presented with an Interior Innovation Award by the German Design Council for their new project Apollo. Adaptability and a focus on standardised fittings are strong directives throughout International Studio's practice. The studio's ethos serves to impart added value and longevity to functional products by presenting frequent opportunity for user customisation. They simultaneously work to simplify fabrication through innovation in universal manufacturing processes, whilst upholding a restrained and economic use of materials. As of 2013 the brand International will grow as the commercial producer of the studio's own projects.